Frederick William Bernet (1887-1977), was born Friedrich Wilhem Berndt on January 9, 1887, in Silesia, Prussia (now divided among Poland, Czech Republic, and Germany), son of Polish Jewish parents : Ferdinand Friedrich Berndt (1829-1887), and Marie Berndt. Records vary regarding the year he arrived in America. The 1920 Census says 1901, or the 1910 Census reports 1904, or the 1930 Census claims 1908. We know for certain he arrived. In 1908, he lived at 279 Fairmount Avenue, Newark, New Jersey. 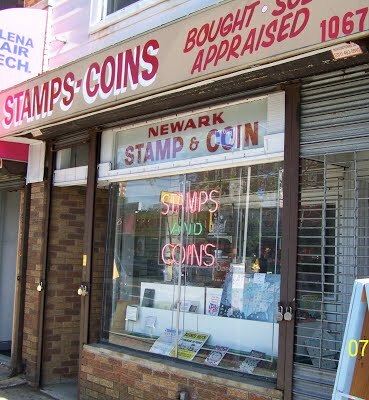 In 1908, at the age of twenty-one, he founded the Newark Stamp & Coin Company, 169 Halsey Street, Newark, New Jersey, which later on was located at 82-89 Park Place, Newark, New Jersey. In 1908, he married Anna Elizabeth Baude, and they had two children : Egon "Ed" Berndt (1910-1998), and Gladys Berndt (1914-). Berndt used to travel to visit his family in Hirschberg, Prussia (now Poland), and bring back postal correspondence with its various franking and postal markings to sell to his clientele. 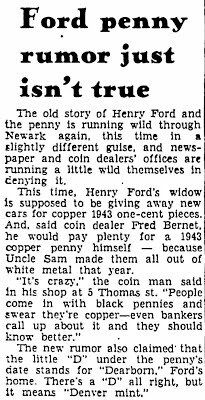 On September 1, 1912, the Newark Stamp Club was organized and published their house organ the Newark Stamp News (1912-1915). It is not clear if Bernet was a member, but it seems very likely. After April 6, 1917, when Congress declared war on Germany, Fred Berndt decided to change his family name from Berndt to Bernet for obvious reasons. However, this did not deter trouble, but may have invited it. He is listed as an applicant to the ANA in May 1934. In June 1934 he is ANA Member No. 4460. In February 1943 his ANA Member No. 9381. The family business is currently run by Fred Bernet's grandson Fred W. Bernet.